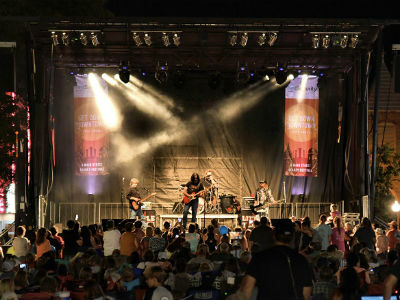 The Searcy Get Down Downtown is a free, fun-filled family event featuring musicians & artists from throughout the Mid-South. The weekend event is centered around the historic court square and begins Friday evening. A children's area is located, in Spring Park, on Saturday and includes inflatables, games, rides and kid friendly entertainment. The event is held the last week in September. Beats and Eats is bringing nightlife to Searcy with their monthly event. 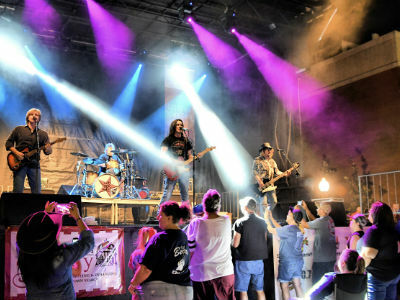 Held on the third Saturday each month, the event features local artists and performers as well as food trucks and vendors. Held the week after Labor Day at the White County Fair Grounds, the fair has been recognized as one of the top ten county fairs in the nation. The event features a parade, a carnival, a rodeo and nationally recognized talent. The Holiday of Lights Festival makes Searcy a special place during this time of year. The city parks, court square, local businesses and Harding University are a glow with of the holiday spirit from Thanksgiving until after New Year. The festival kicks off with a televised lighting ceremony that concludes with the opening of the ice-skating rink located in historic Spring Park. For a small fee the whole family can rent skates and enjoy skating under the lights. The Searcy Christmas Parade features lighted floats, animals and cars. It’s a favorite of the young and old alike. And what Christmas would be complete without a visit with Santa at the Santa Hut located on the Square. Take a step back in time at the recreated 1800’s village donned with red and green decorations for Christmas, where children can visit with Santa and families can enjoy sugar cookies. Children can also play pioneer games and activities including seeing live farm animals. Volunteers, dressed in period costumes, share facts about the buildings and pioneer life, as well as demonstrate pioneer crafts, including blacksmithing, spinning, quilting, knitting, leather working, Dutch oven cooking, wood working and more. Parking and admission is free. This Christmas, come and experience the birth of Jesus at First Assembly of God in Searcy. This adventure will take you back in time for you to experience first-hand the birth of our Savior. 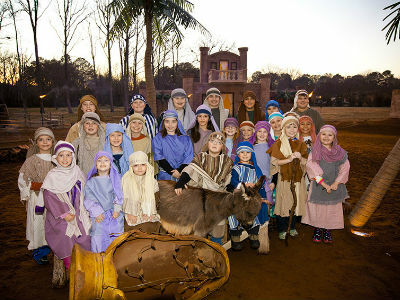 The annual Living Nativity features live animals and professionally crafted scenery to provide a memorable Christmas experience. The event is typically held for two weekends in December. Admission is free and donations are welcome.